The play right now is in the metals space – gold, silver, industrial metals, mining, etc. The steel sector as a whole isn’t doing real well right now, but what the heck steel it’s a metal and GSI is showing massive buy demand on a recent breakout. Take a look at the chart below. At the beginning of March General Steel (GSI) staged a massive 60% breakout move with extremely heavy volume and now needs to retrace much of that move, providing a 2nd chance opportunity. It has already retraced half of the entire move, but I believe there is more to go possibly down to the 1.15 – 1.20 level which would provide an excellent opportunity to scale in with a small 1st position. Perhaps that move takes place quickly out of the gates Monday morning. This is a stock that soared from just over a buck to above $19 in about 9 months back in 2007. Could a move like that happen again? It’s not impossible, but of course the chances are extremely slim. That doesn’t mean you could get a quick double or triple out of this one in a very short timeframe! Disclaimer: I have no position in GSI at this time, but may look for an entry within the range I described above. Home Values Have Soared Over Past Year! Across 20 major US cities, the average home value increase was 12.4% which is the most in 7 years! However, it looks as though the rate of increase has peaked for now. “More cities are experiencing slow gains each month than the previous month, suggesting that the rate of increase may have peaked,” David M. Blitzer, chairman of the index committee at S&P Dow Jones Indices, said in a statement. Prices rose fastest in Las Vegas, which saw annual gains of 27.5%. Prices in San Francisco jumped 24.8%, Los Angeles 20.8% and San Diego 20.4%. Sure seems like a mini bubble in housing right now particularly with mortgage rates a full percentage point higher in the past few months. Twitter IPO Headed to the NYSE? Rumor has it that Twitter is leaning towards listing on the NYSE. The company announced (er, rather Tweeted) a couple weeks ago that it had filed for an IPO confidentially which means the company can keep its financials under wraps until 3 weeks before the IPO prices. We’ll continue to follow the news surrounding what should be a much hyped (overhyped?) IPO. Perhaps this is the IPO that marks the top of the internet stocks frenzy over the past year. Hey, we could all use some inspiration once in awhile! Print these out and pin up in the office. Is Apple’s Big iPhone Estimate Beat Overblown? Some analysts are questioning just how well the iPhone 5C is selling because Apple includes phones shipped to retailers as sold. One analyst said, “the 5C appears to continue to be (uncharacteristically) widely available, suggesting that Apple may have been overzealous in estimating its appeal.” If you’re trading AAPL, get a free daily analysis of the chart here. iTunes Radio Impressive Debut. Does It Spell Trouble for Pandora (P)? In 5 days iTunes Radio added 11 million users which will put in the realm of iHeartRadio. Next up is Spotify with 20 million users and the behemoth in the niche Pandora (P) which has 65 million users. Analysts disagree on the impact it will have on Pandora. There are cases for and against so if you’re trading Pandora you’ll need to keep a close eye on the chart. The iTunes Radio news has been out for months and the stock has done VERY well since then. It has pulled back a bit on news of the success of iTunes Radio, but given the huge run in the stock, this is a very normal pullback right now. You can get a free daily analysis of the strength of the Pandora stock chart here. Applied Materials (AMAT) is surging higher today to a new 5 year high after it was announced it would merge with another global giant, Tokyo Electron Limited, in an all stock transaction valuing the new company at nearly 30 billion. The merger brings together complementary technologies in the semiconductor and display markets and is expected to close in about a year. After the close, Applied Materials shareholders will own approximately 68% of the new company and Tokyo Electron shareholders approximately 32%. The combined company will have a new name, but dual HQ’s and a dual listing on the Tokyo Exchange as well as the Nasdaq. As mentioned above, AMAT is looking quite bullish and breaking out to a multi year high today. It probably needs to spend a few weeks digesting gains at some point soon, but AMAT appears to be a solid long term play. You can get a free daily technical analysis “analysis” of AMAT for free here! Don’t miss it. Earlier today I mentioned that the small biotech/pharma plays have really been moving and while I typically stay away from these highly risky and volatile plays, they can provide for outstanding shorter term trades with smaller positions. This morning I highlighted the trade in ENTA which staged a big breakout and just needs a retrace of that move to provide an entry. Another trade I’ve got my eye on is NSTG which is flashing a chart that looks like it might be ready to explode higher. The company is in the instrumentation and analysis business which is obviously less risk than a company relying solely on pharmaceuticals, but still considerably risky (albeit with a potentially huge reward). NanoString Technologies (NSTG +41%) soars after receiving FDA 510(k) clearancefor its Prosigna diagnostic test. The test uses the gene expression profile of cells found in breast cancer tissue to assess a patient’s risk of distant recurrence of disease. While I typically focus on the technical action in the chart for shorter term trades, it’s a good idea to get an overview of the company you’re about to put cash in to. Here’s a good place to start. The chart of NSTG is exceedingly bullish, with a nice pennant formation squeezed to smaller price swings and ultimately resulting a breakout today from this bullish formation. If you got in today, you’re sitting great. It would still provide entry in the morning if it doesn’t gap up big at the open. Be sure to get your free daily technical analysis of NSTG here. It’s been a volatile few months for solar stocks which saw a big surge off the bottom late last year only to retest those lows recently. Today, solar stocks get a spark in positive guidance from First Solar (FSLR) which posted much better than expected guidance, but it remains to be seen if they catch fire again. It’s too soon to begin calling another bottom in solar stocks, but today’s buy interest/short squeeze definitely means you should put solar stocks back on the radar for a potential trade in the coming days and weeks. Analysts see FY13 sales of $3.15 billion and EPS of $3.46. Shares of First Solar (FSLR) were up nearly 50% earlier today. It has come off the highs just a bit, but is still trading at a new 52 WK high with very heavy volume. 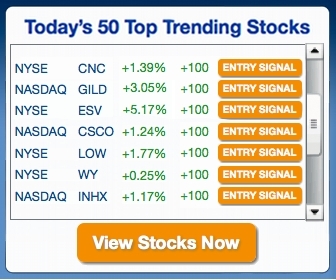 Suntech Power (STP) is also up big at 33% and most of the other solar stocks are up anywhere from 10 – 20% today. The Guggenheim Solar ETF (TAN) is up 15% and breaking out of a downtrend. In my opinion, if these solar stocks retrace the majority of this today’s move, that would setup a real nice, lower risk entry point.